What happens in the air, stays in the air. That’s the way it usually goes, but some intrepid souls have defied this law of the universe to bring you the best, and worst, snaps captured mid-flight. So return your seat to the upright position, because you may just fall off laughing. 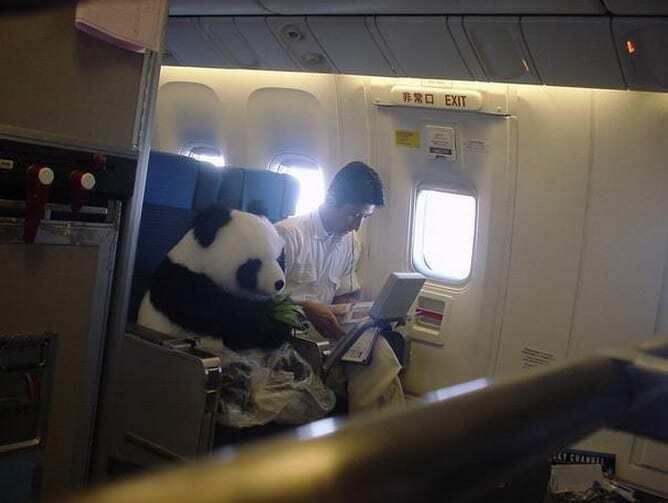 Welcome to the Panda Express… not the Chinese buffet, the only airline in the world where cuddly, fluffy panda bears get to fly first class! We have a hunch that this living, breathing, bamboo eating teddy bear is heading somewhere special. He’s sitting beside someone who appears to be a wildlife professional or perhaps, his special appointed caretaker. Sadly, the panda isn’t actually real, but a giant stuffed bear. Apparently, the staff of China Airlines put this cute little guy on their plane as a publicity stunt. Real or not, that is one adorable passenger that we would definitely not mind having to sit next to on our next flight! 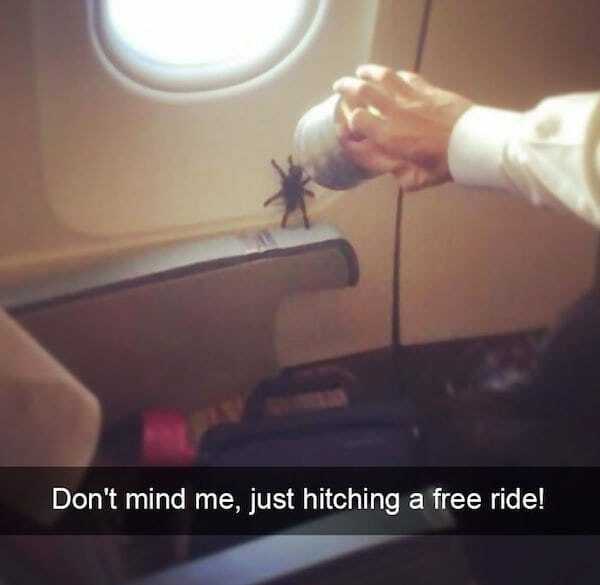 Who needs to visit an aquarium or zoo when you can see some free wildlife on your very own flight! 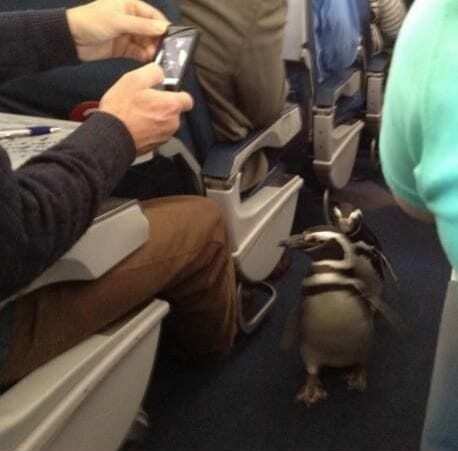 It is definitely a pleasant surprise, for both us and the passengers, to see this small and extremely adorable pair of penguins joyfully waddling down the aisles of an airplane – and yes, believe it or not they are real (unlike the panda in the previous page). The only concern that comes into question is whether or not the temperature on board was suited for these elite, wild guests. They were captured on camera being shuttled to first class as guests of honor for the joint BBC and Discovery Channel series Frozen Planet. Who said that penguins can’t fly? Is That You, Jiminy Cricket? It’s not uncommon to see people with their laptops out and open doing some work while they are flying from place to place. 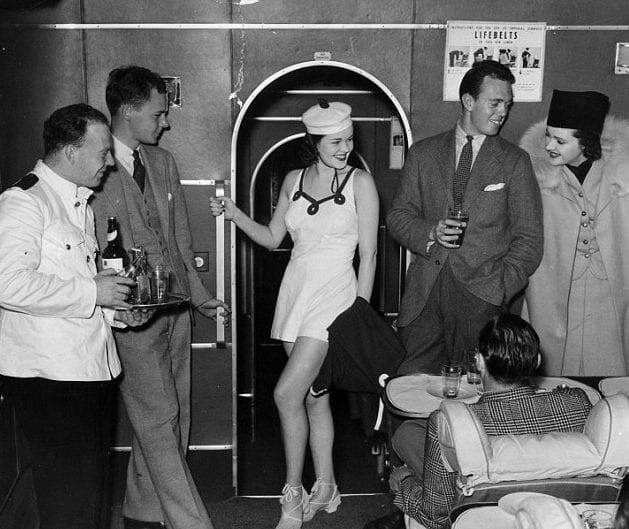 But did you know that people would do the same thing in the early days of air travel as well? The main difference was that they would bring typewriters as opposed to laptops. Here we see Walt Disney on a plane getting some last minute work done with what appears to be, Um, Jiminy Cricket. This young man has got to be the luckiest son of a gun we’ve seen on any flight! Not only did he have an entire plane to himself, but it was a flight on Delta! If it were us who won this airborne experience, we’d stock up on enough pretzel bags for days. But, you know what? 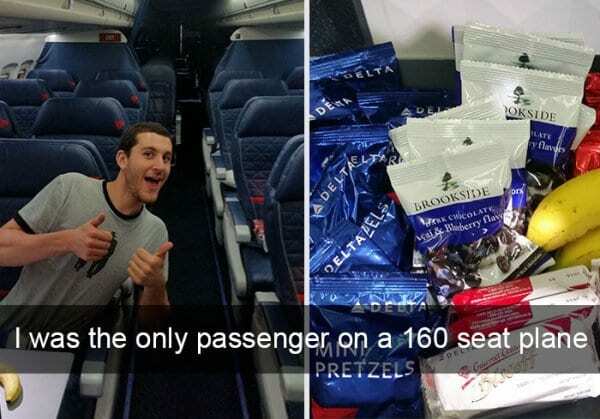 Forget about the snack and drinks… think about the leg room this dude must have had! Plus, he probably got all of the fresh pillows to himself, too. Therapy pets come in all shapes and sizes these days, even as turkeys. 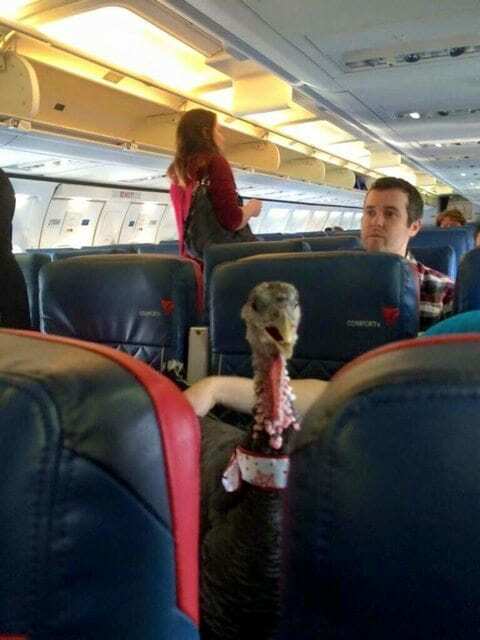 This passenger was approved to bring his farm friend on board with him, to you know, keep him emotionally comforted in case of any turbulence. Another flight, another therapy pet. This farm animal probably makes a little less noise than the turkey, although, he also probably smells a lot worse. But at least he’s still a super cutie! 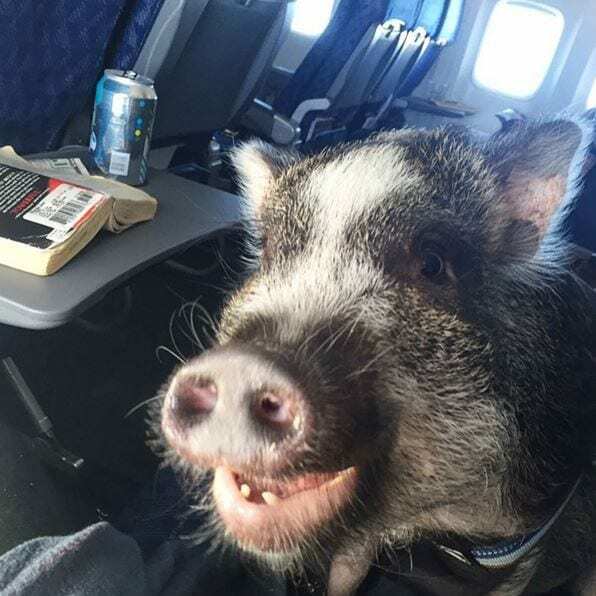 But our prediction still stands from the first therapy animal photo – Porky might want to make a run for it if the plane gets stuck on a deserted island with hungry passengers. Nevertheless, this not so wild looking boar seems to be having the time of his life, and we’re sure his owner is as well. Some people like dogs while some people like cats. Some even like rats! But it seems like this person really really likes stuffed… cheeseburgers? 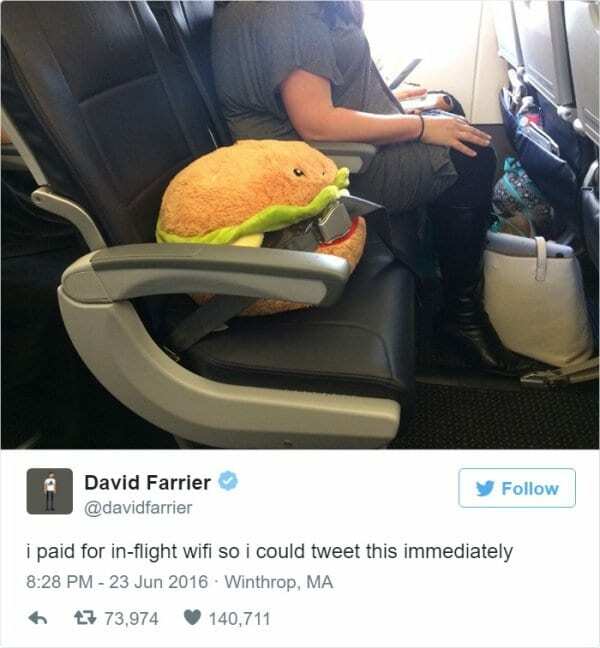 We also value the life of our own hamburgers so we can understand this passenger’s desire to keep him safely buckled up. A list of explanations for this hamburger’s special attention is possible; maybe he was just dry-cleaned? 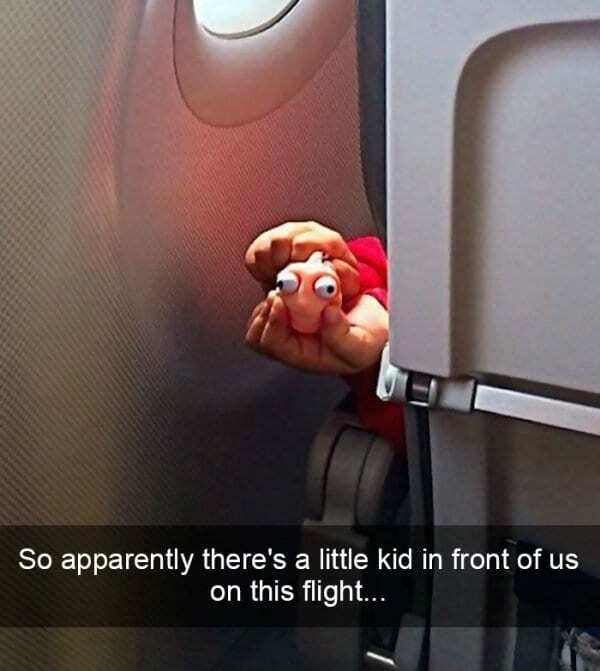 Maybe some kids on the plane were trying to kidnap and eat it? Who knows? There are two key elements in this picture that we absolutely need to discuss. First of all, this duck is wearing a leash – like a puppy! Second of all, his little webbed feet are wearing comfy, soft socks so he can safely walk around on the plane! This is one of the cutest therapy animals we’ve seen allowed on a flight so far, hands down. And with that long neck of his, you can bet your bottom dollar that he gives the best cuddles. Is that Bullseye from the target ads sitting all curled up on the chair? Look how humble he is flying in economy like the rest of us! He looks so calm and happy, and we’re sure his owners are as well. Maybe he’s going to go act in a new Target commercial? 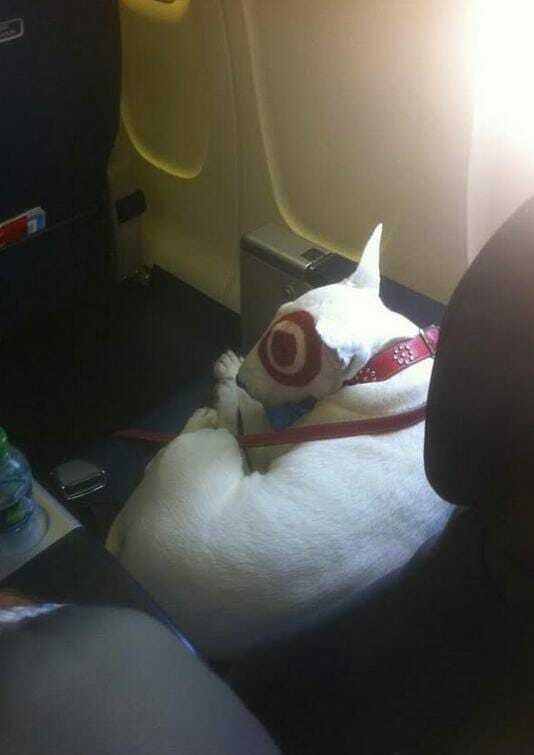 Or maybe his owner just painted the Target symbol on his eye to get preferential treatment. Regardless of his possible celebrity status, he’s still a dog – which makes us want to pet and cuddle him anyway! No way. It actually happened. Someone has actually gone through with it and spent $100 on an ostrich head pillow! Despite it’s crazy appearance (the company knows it looks super goofy and even talks about that fact), this pillow is apparently one of the most comfortable travel pillows ever created. It’s breathable, soft, blocks out noise, and lets absolutely no light in. So while we’re here laughing, he’s probably getting the best sleep of his life. 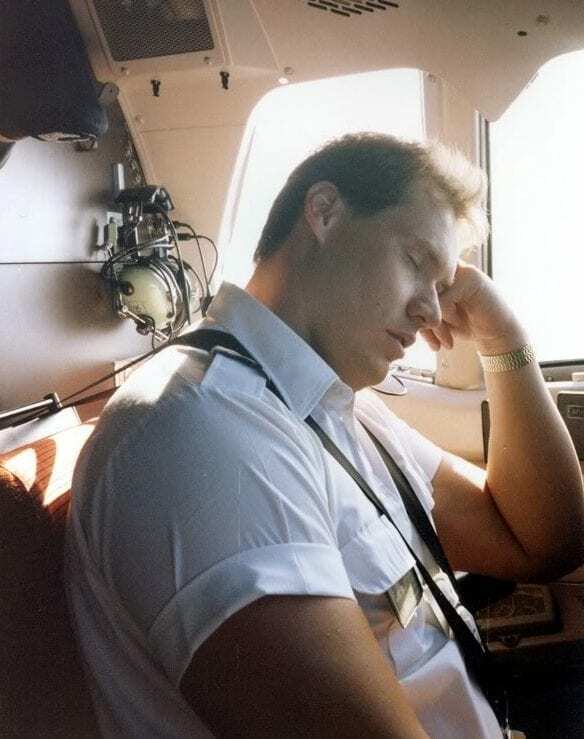 “1/2 of pilots sleep while flying and 1/3 of the time they wake up to find their partner asleep.” The next time we board a plane we’re going to seriously consider setting an alarm on our phone for the pilots. Unless they make us turn off all cell phones before the flight. The problem with bringing your own kangaroo on board is that you need to purchase an extra seat for him to sit in. The plus side to bringing your kangaroo on board is the extra pocket space you have. 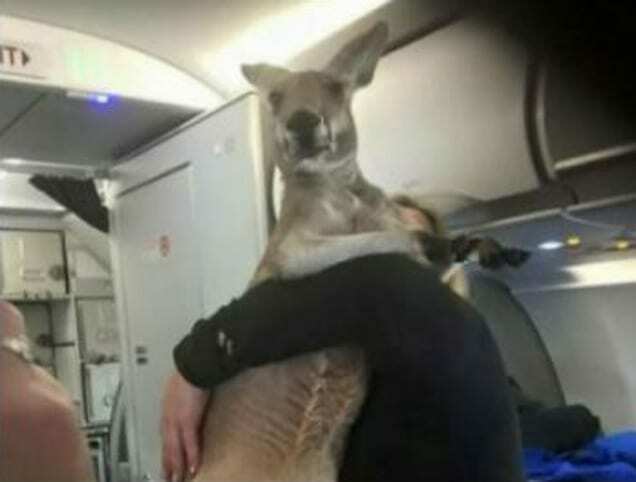 If there wasn’t enough room in this passenger’s carry-on, his pet kanga might have been willing to hold his wallet and cell phone for him in his pouch. We’d also probably use him like a fluffy pillow instead of falling asleep on our neighbor. It’s passengers like these who ruin the plane riding experience for the rest of us! Note to self: belligerence is not tolerated on an aircraft. Also, if the flight attendants run out of duck tape when confining you to your assigned seat, they will not hesitate to use a zip-tie around your knees. 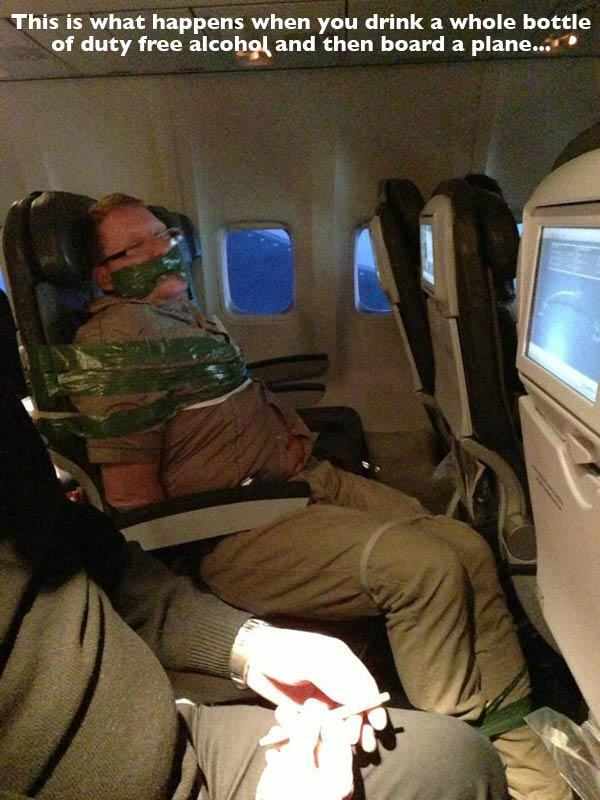 They could have just used handcuffs like most airlines do but maybe their usual air marshall wasn’t on board. Or maybe… this guy is the air marshall. This guy either needs a Father of the Year Award or a shower, as soon as possible. 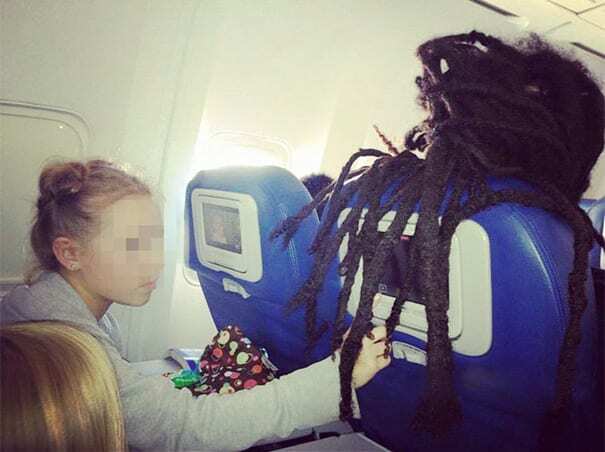 Disregarding the obvious fact that this is so not safe for a child to be sitting on his head, it still looks like a clever way to keep kids occupied on the neighbor passengers off your back… even if your kid is on it. We wonder how the passenger sitting in back of him feels, though? Hopefully, entertained. Some people do not care at all. 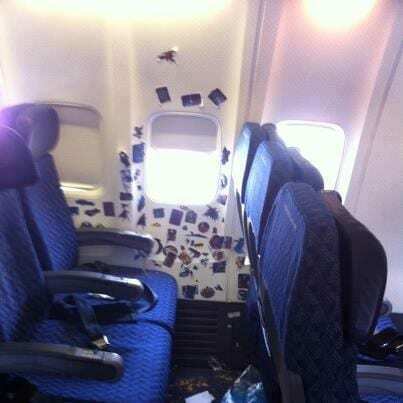 Furthermore, some passengers do not deserve this kind of mid-flight luxury if this is how they take advantage of it. If you’re going to leave your legs in the aisle, can you at least make yourself decent by zipping up your fly? 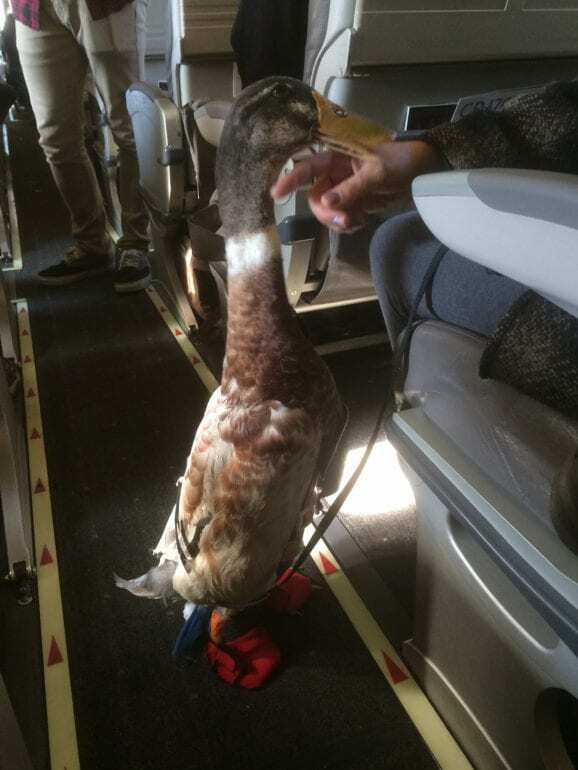 Oh, and while you’re at it – get your legs out of the aisle so the snack cart can come through, please. Thank you for flying. Remember how we literally just said that some people do not care at all? Here’s another prime example that supports that statement. At least, make it look like your *not* trying to get caught! Plus, the flight attendant is simply just doing her job in the required uniform she is meant to wear. There’s a moon outside of your window to stare at, you know? 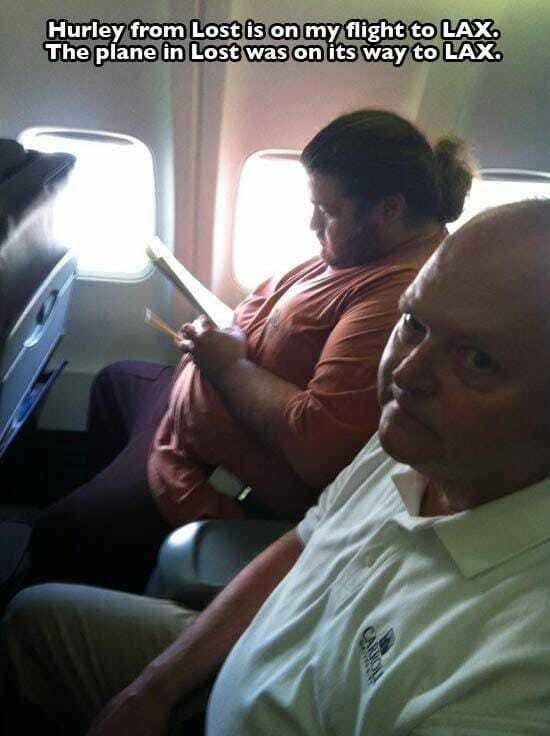 We certainly hope this guy’s wife wasn’t on this flight. She’d be pretty embarrassed. Getting into a fight on a plane is never a good idea. But, since these girls were caught in the act and on like, a hundred different cell phones on board, we have a feeling they won’t be getting away with their inappropriate behavior. Hopefully, they sold popcorn on this flight as a free entertainment snack! To us, this seems like the type of situation that belongs on Jerry Springer. Or actually, Dr. Phil for that matter. Actually, this is way too cute to get annoyed at! 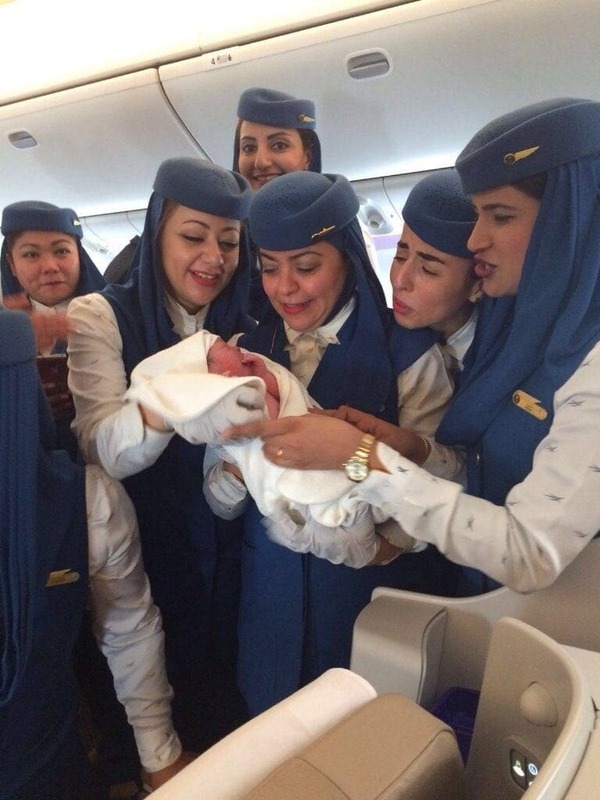 If all babies were as charming and adorable as this during plane rides, then they could all come without us fussing! If we had to use deductive reasoning, we could conclude that this passenger was simply trying to avoid getting sick and to tell you the truth, we don’t blame him (or her) one bit. 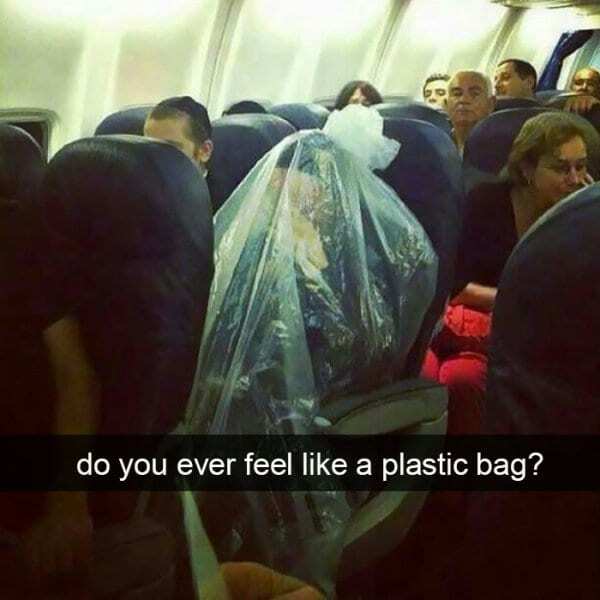 Maybe this is what American Beauty, or Katy Perry for that matter, meant by feeling like a plastic bag? On the other hand, this is a tad bit dangerous and should never be attempted by anyone under the age of 16 at home. We need to give some serious props to this photographer. This photo of the dinosaurs is so cool and completely creative. Maybe he should have been the executive producer for Jurassic Park 2? The whole film could have turned out so much differently. Either way, this airplane photo is one of our favorites, for sure! Next time, we’ll take our Barbies or toy soldiers on the plane and see if it has the same effect. We understand why cell phones needed to be turned off. And we certainly understand why radios and laptops needed to be turned off. But, why the battery operated Gameboy and walkman? 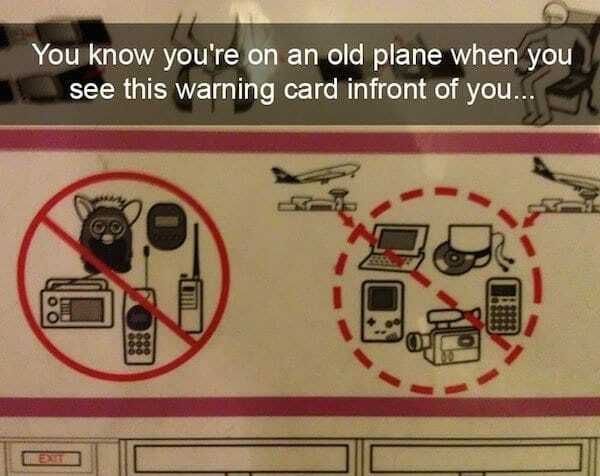 Also, there is nothing wrong with using a Furby mid-flight! Unless that whole secret government spy rumor turned out to be, of course. These signs could also be used as a loophole. Next time when we want to keep using an iPad, we’ll ask to see the disclaimer. Pay for a flight to wherever you’re going, and apparently, a free puppet show comes with it. If this passenger was on an older airline with no television to keep him occupied during his flight then this spur of the moment entertainment isn’t such a bad deal after all, is it? Especially if it’s a silent puppet show and he’s putting on a production Finding Nemo! If only we had our small, Dory toy to play with. Someone caught a snapshot of a musician and his mini-keyboard, who clearly wore himself out making the most of his plane time practice. We notice he has a set of audio headphones as well, which at the very least, makes him a considerate musician on a very crowded plane. We wouldn’t mind hearing his slow jams if we need to be serenaded to sleep also. Do you think he’ll play Barry Manilow if we make the request? This American Patriot got the airplane ride of his life when he was called up to voice over the safety protocols and procedures for the flight. He looks like a good assistant to have around and he seems pretty enthusiastic. There’s also the possibility that he used to be an attendant is reliving his old glory days! 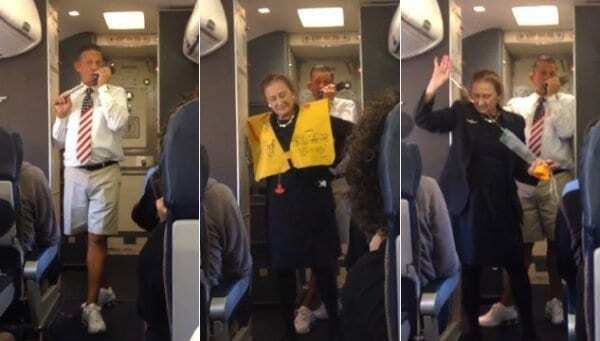 Regardless of the situation, we’d like to have this much fun on a plane. Without the kids around, obviously. We have another germaphobe, ladies and gentlemen! We need to agree with this level of caution, though. An airplane is a cesspool of living and breathing bacteria, the combination of other people’s germs, and the cold air conditioning doesn’t help either. 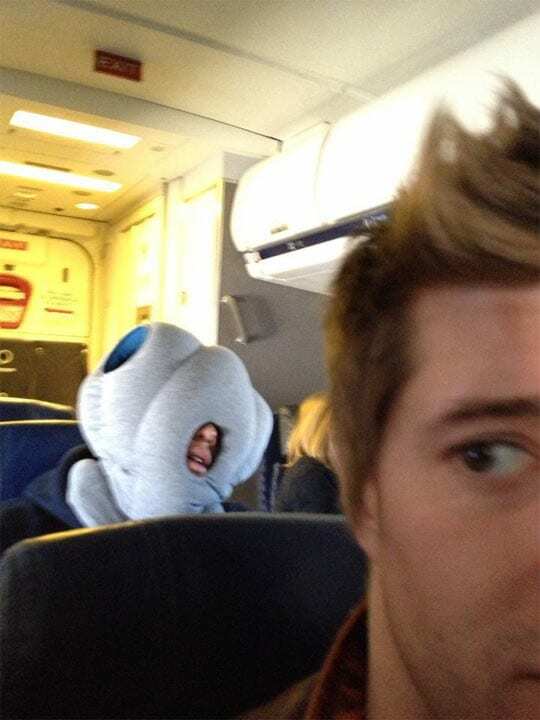 If this passenger invested in one of the space helmets pillows like we saw earlier on the list then that might be effective, too. Maybe he just likes the blackout effect? Who knows, really. 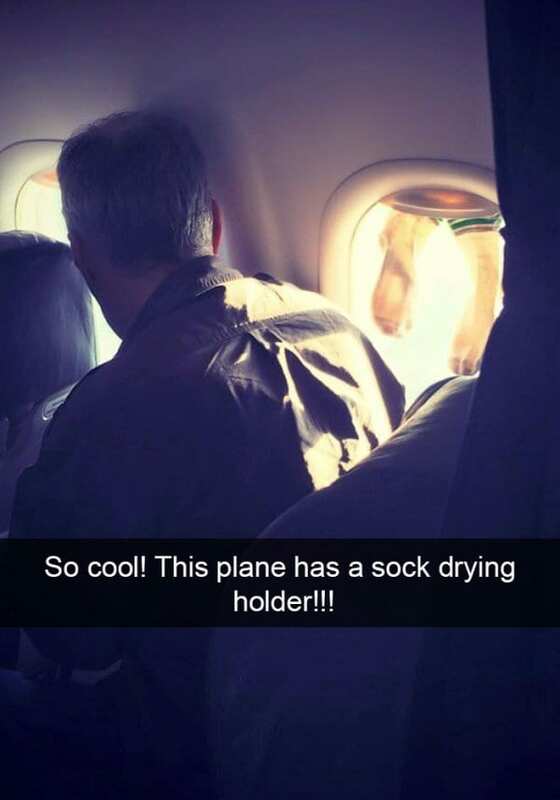 As it turns out, the awful stench coming from the back of your plane isn’t the bathroom – it’s that one guy who thinks it’s okay to dry out his socks using the window cover. We don’t know how his socks got wet in the first place, or if they were even wet at all, but we don’t care to find out. All we know is that this is so not okay. Or hygienic, entirely. We’ve still a got few farm/therapy animals to show you on our list but just as a heads up, as you can see by this picture, the animal passengers just keeping stranger and more peculiar. 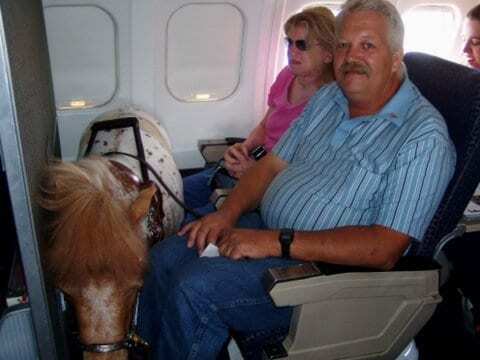 We hope that these passengers let that mini-pony stretch his legs out a bit in the aisles. Truthfully, we’re more concerned with the pony’s legs than theirs! You think if we offer to pay, they’ll let us ride the pony? Don’t you just love seeing the soft, melted center of a biker dude with a rough exterior? 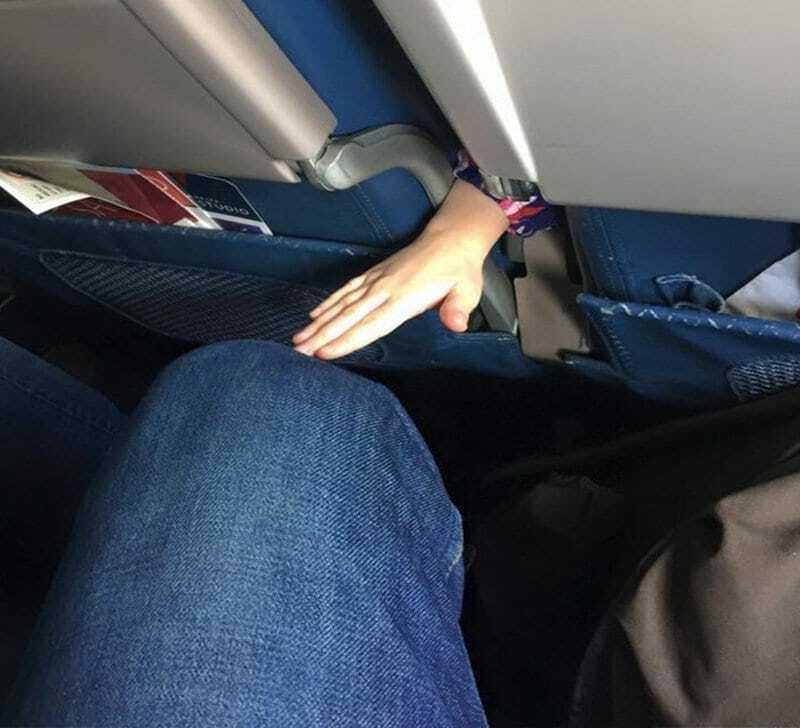 It looks like this businessman made a new friend during his flight and even gave him a shoulder to lean on – even if it was against his will and a total surprise. The biker dude just wants a cuddle buddy to sleep on but then again, don’t we all just want someone to keep us warm at night? This is something you would see on a sketch comedy show or a reality tv show. 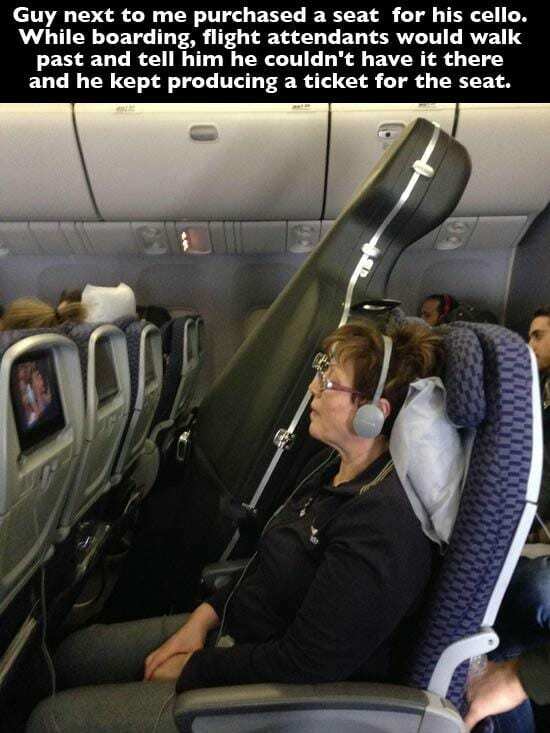 Not just the cello having its own seat, but the owner of the instrument pulling out a ticket that guarantees it has its own spot on the plane. This is either a very expensive cello or it has significant, sentimental value to the musician traveling with it. That thing better have been signed by Yo-Yo Ma or someone else famous. …somebody’s watching me. This may be a tattoo or some form of temporary artwork but either way, it’s creepy. Do you think it would be rude for another passenger to politely ask this man to wear a baseball cap? Or a beanie? 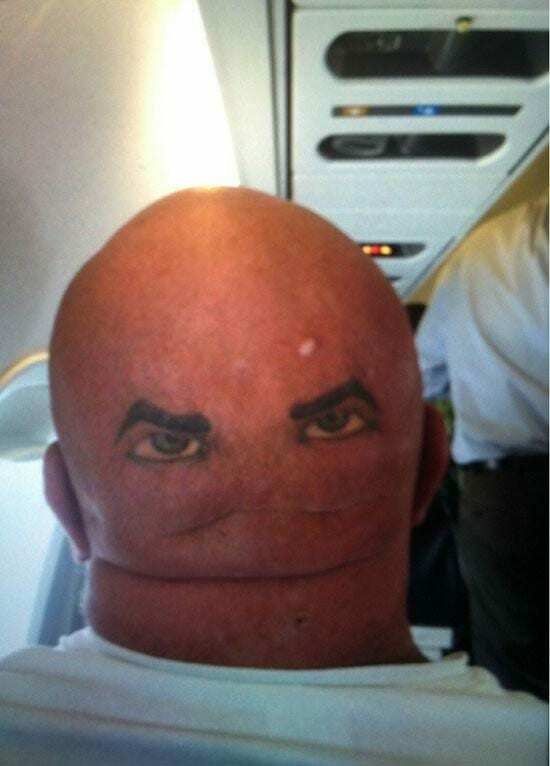 Or anything at all that will make his back of the head stare less intimidating for the duration for the flight? If we had a pair of sunglasses, this would be the only acceptable time to use them indoors. If there is a tarantula on the plane we’re passengers on, you better believe we’re opening up that emergency door and jumping into the nearest lifeboat! Just kidding, sort of. We would definitely overreact, though. Snakes on a Plane already gave us enough nightmares and in our case, we wouldn’t be so lucky to have Samuel L. Jackson around to take care of that massive spider. So, no thank you. For nostalgia’s sake, let’s just quickly relive the good old days when taking a plane ride meant having a blast while transiting from one destination to the next. Granted, it was a different time, but looking at this astounding photo truly makes us believe we were born in the wrong decade. What do you think? Are airlines safer now than they were before? 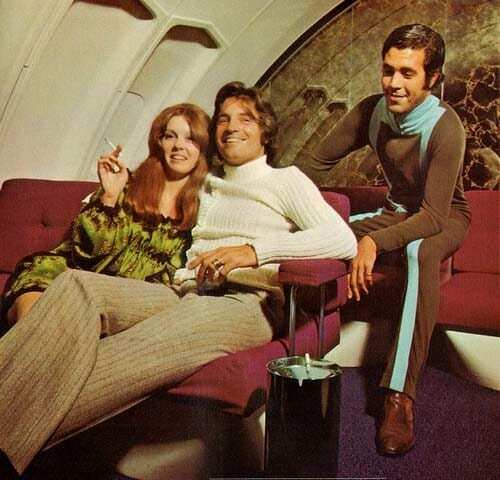 We know they were definitely more fun back in these party plane decades! These airlines really aren’t making emergency situations less stressful for their passengers on board. 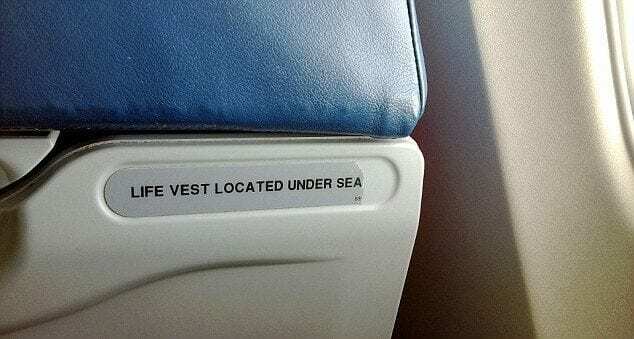 Having to dig for your life vest by the ocean floor is an unpleasant thought to have. Understandably, this is just a funny coincidence. But in retrospect, this makes us consider just how often these planes are detailed and maintenanced up to aesthetic standards? 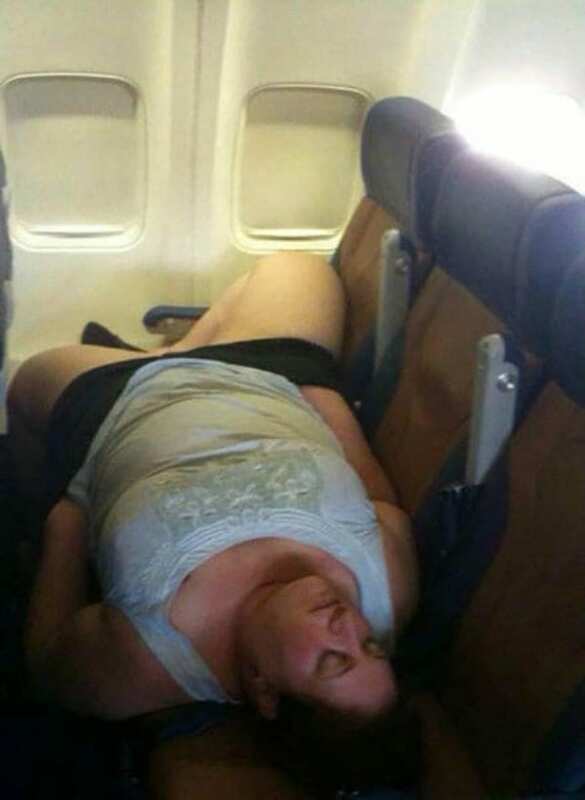 Sometimes, a passenger can get the wrong idea so these airlines need to be much more careful! 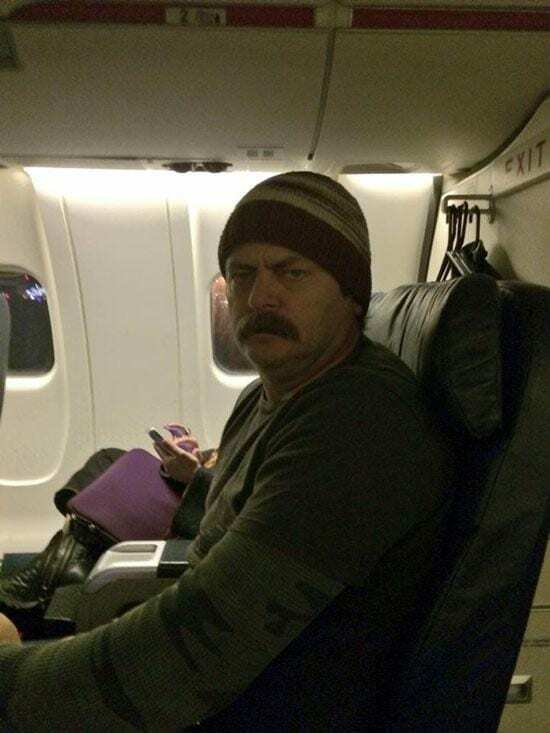 Just like Ron Swanson on Parks & Recreation, actor Nick Offerman doesn’t seem too enthused that the passenger’s seated next to him are stealing the genius photo-op. We can’t really blame them though. If we saw the notorious Ron Swanson on our plane we would also want to document the proof of the close encounter of the amazing kind! Do we dare ask him where Leslie Knope is? Nope, probably not a good idea. For all of you Lost fans out there, you’ll enjoy this one. Hurley from the hit tv show was on this passenger’s flight, going towards LAX. Does that remind you of something familiar? Maybe the show’s first episode? Yeah, we would be a little caught off guard (and secretly spooked! ), as well. We hate to say that this could be an omen (knocks on wood) but yeah, this could be a sign. Better safe than sorry. Another blast from the past pictured below. 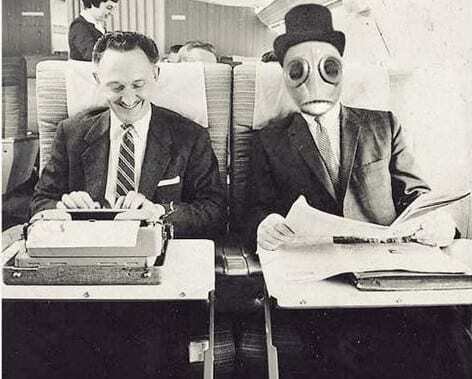 Smoking was allowed on flights during the 60’s and 70’s, before the rules changed forever and for good reason too. What we love about this picture is the man behind the couple posing for the photo – is he interested in the woman or does he want to light up a stogie of his own? This picture is just a prime example of how much flying has changed. 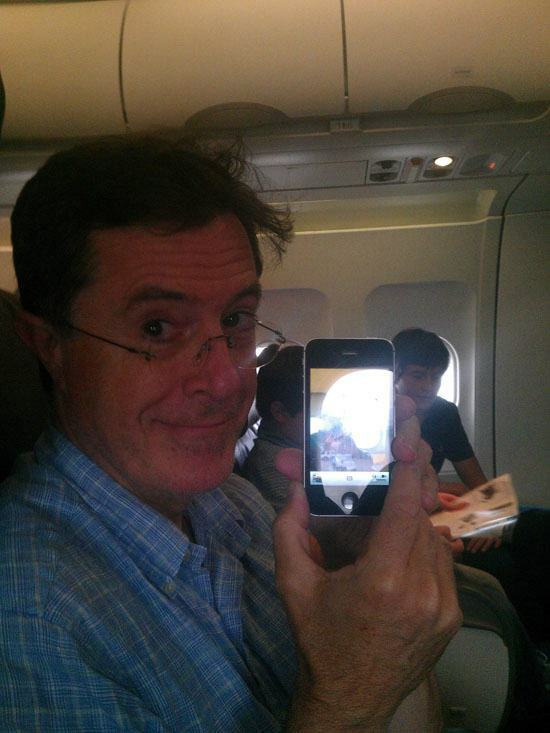 Having Stephen Colbert sitting next to you on a flight to, who actually cares where would be the highlight of life! The photo itself doesn’t need to be exponentially funny ’cause in truth, Stephen Colbert’s presence is just hysterical enough on its own. And when you’re tired of the laughs, we’re sure Colbert has some solid, valuable information to throw your way. Do you think he’d let us call Jon Stewart on his phone if we asked nicely? 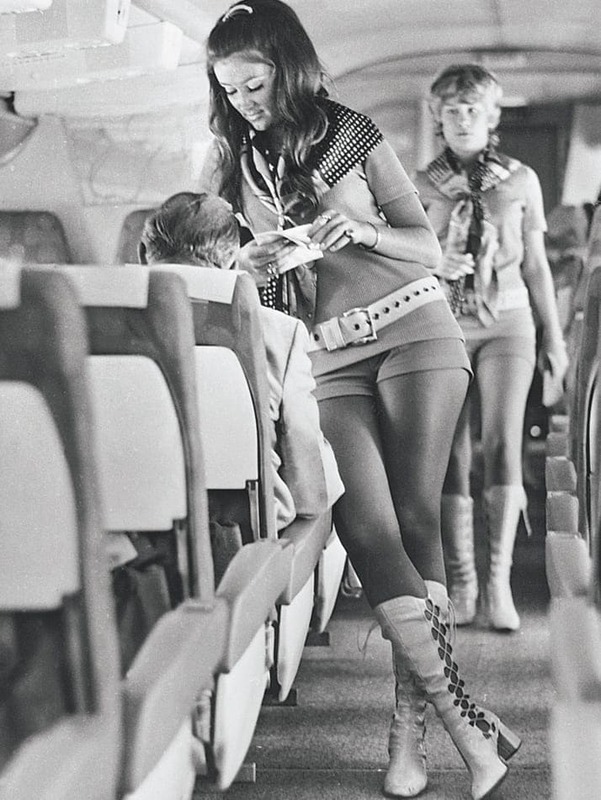 We know hot shorts were appropriate for flight attendants at the time this picture was taken but so were a lot of things that are now illegal on a plane. In the 60’s, it was natural for flight attendants to play the part of the attractive sky vixen but today, passengers are expected to treat them like the professionals they are. They are still so beautiful, though. Some things never change, excpept for the material of those shorts. 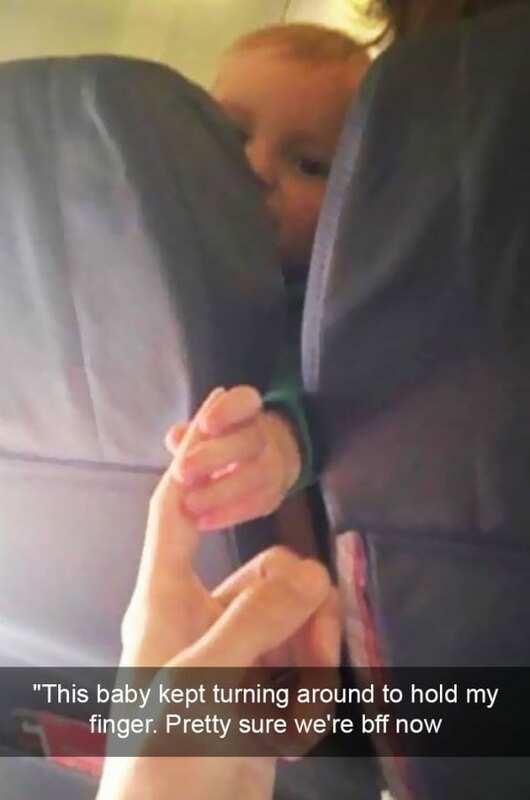 A baby born mid-flight is being passed around like Simba over the great kingdom. Except, the kingdom is the sky and we have no idea what this plane’s exact location is. M Night. Shyamalan must take a lot of airplane rides with the cast members of his movies because we’ve seen way too many pigs boarding aircraft’s on this list. We’ve got to say – we’re impressed with the stamina and upper-body strength on this woman. 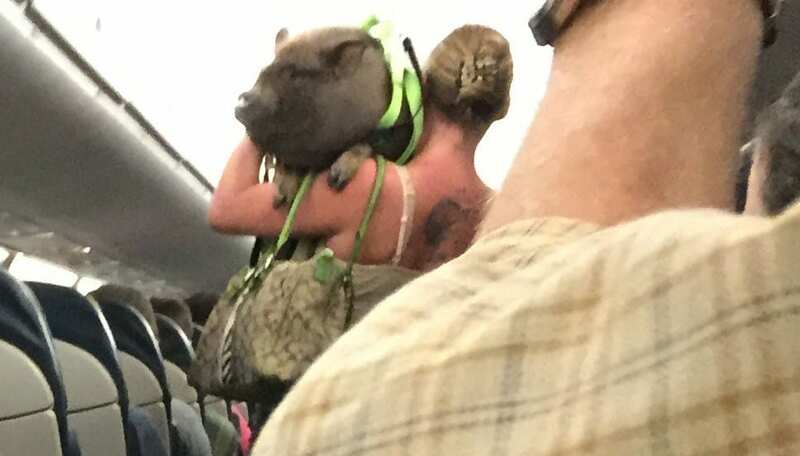 That’s one large pig to carry through a plane and she doesn’t look like she’s struggling one bit. If they make pig leashes in size large, then that might be a good solution for next time. The centerpiece of this photo is obviously the sleeping woman who’s practically falling out of her seat but if you look behind her, you’ll notice a pair of concerned and startled eyes peering over the top of her chair. We don’t know about you, but it’s this female passenger that really brings the whole photo together for us! It’s comedic gold. It’s kind of like that Goldie Hawn ‘Overboard’ movie, except, sort of not. This couple hit the bottle, or should we say multiple bottles, a little too hard. 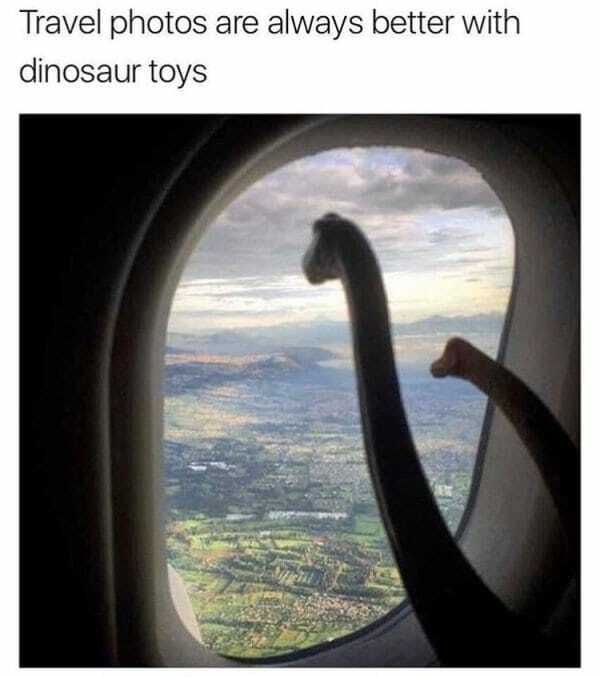 But hey, at least they weren’t the ones operating the plane! We’re sure they had brutal hangovers when they woke up after the descent. 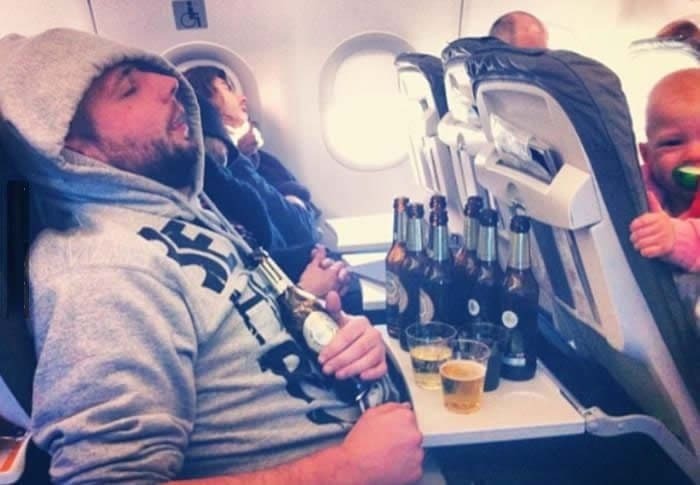 Be careful when drinking on a flight – the high altitude backfires on the drinker consumer their chosen choice of adult beverage! They probably taught some passengers around them some decent college, drinking games. you know, what the kids are playing these days. 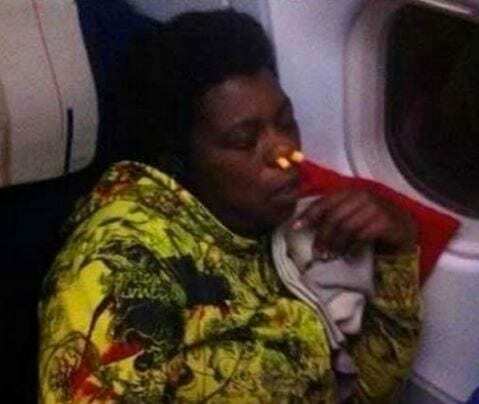 When this lovely woman put these two “yellow thingies” in her nostrils, she was probably wondering why it was still so noisy out there in the plane. Luckily, it looks like this didn’t keep her from falling asleep or literally, not being able to breathe, which is kind of important. Don’t you think? Maybe we’re jumping to conclusions; there’s a possibility some rancid smell was keeping her awake. It is a plane, after all. 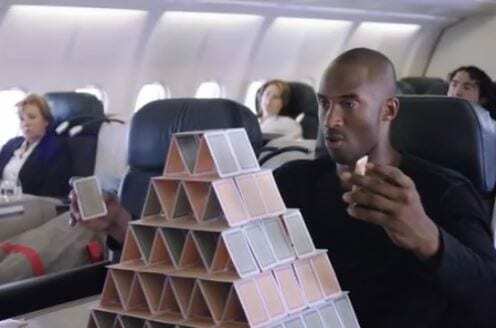 Well, well, it looks like after retiring from basketball, Kobe Bryant has decided to develop a new career. We’re guessing he’s on his way to Vegas and using the time to prepare for his job interview in a Casino. He could also be preparing to be a magician. If he is on his way to Las Vegas, maybe he’s auditioning to be Cris Angel’s new assistant. After Dennis Rodman’s stunts, you never know what these basketball players are thinking. 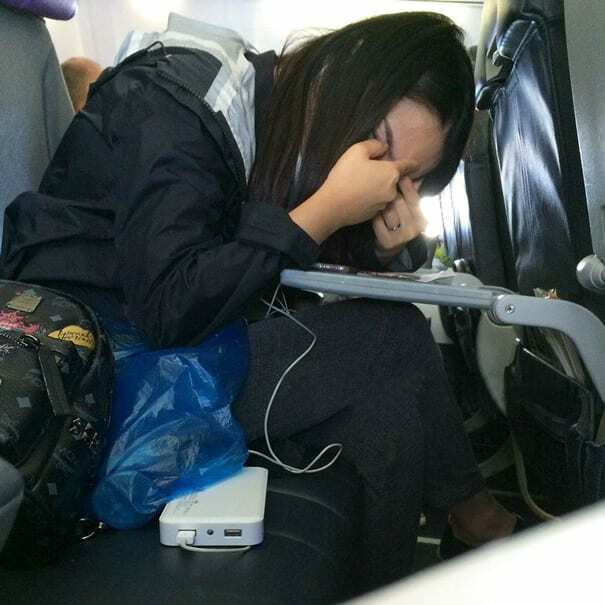 When we see this flight attendant sleeping so peacefully, yet so uncomfortably in her seat, we are instantly reminded of all these times we almost fell asleep at our desk, after a big lunch at work. At least she has those handy-dandy seatbelts, though. Otherwise, she’d get a pretty big bruise smack in the middle of her forehead. She’d probably still be pretty, though. All flight attendants are. In retrospect, this isn’t really a ‘fail’ at all. There are many things we don’t want to be reminded of while flying 36,000 feet above the ground, one of them is definitely a plane crash. 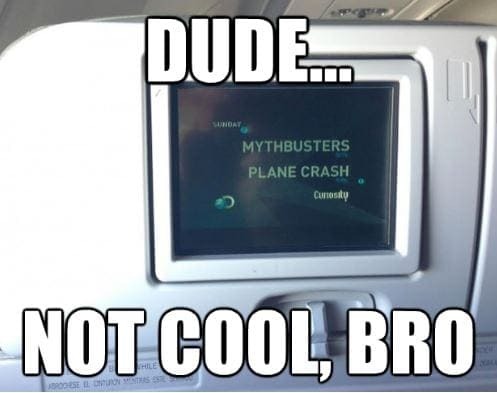 Do you think the airline was aware of this ‘Mythbusters’ programming or was it just a crazy coincidence? This is actually a bit more unnerving than the whole Hurley from Lost situation being on your flight. At least Hurley was just a character on a made up tv show. Right? 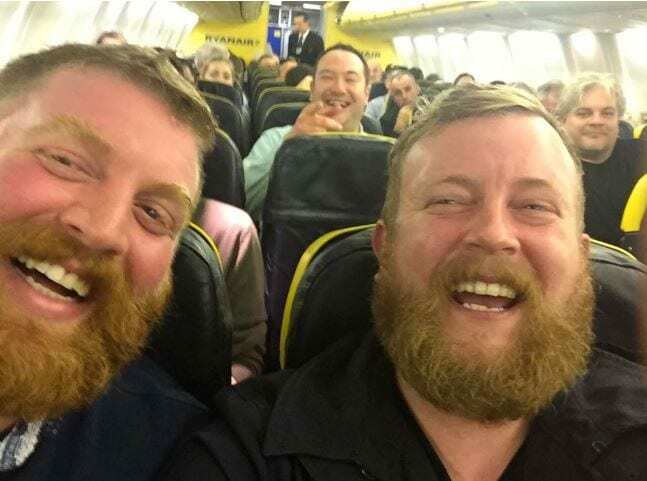 These two redheads just accidentally met each other during a flight. Although you would think they are twins, they are actually complete strangers. Indeed an epic coincidence. It’s too bad that this plane didn’t have a camera crew on it. It would make a great 20/20 special or an episode of Long Lost Twins or something. What? That show doesn’t exist yet? Well, it probably should and these guys can be the hosts. You know you’re safe when you get Chewbacca as a co-pilot in your plane. We hope Hans Solo doesn’t find out about his friend’s extra gig. Unless Han Solo is one of the pilots flying your craft to its destination. We would trust Han no to fall asleep while flying the plane like some of those other pilots do! 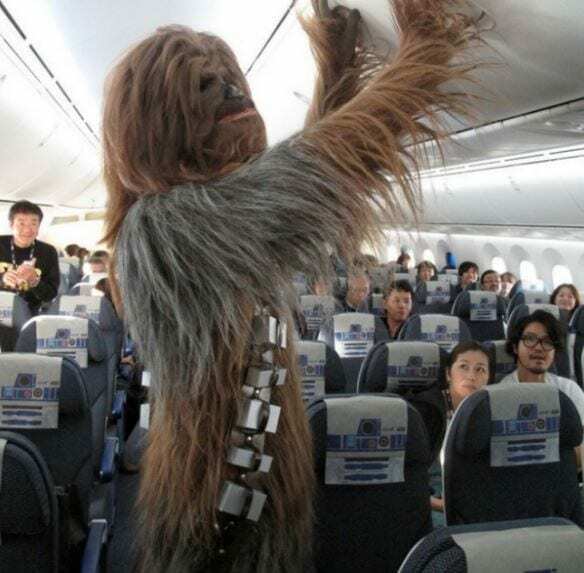 Chewbacca would be the perfect in-flight pal anyway. You agree with us, right? We knew it. Where is Stephanie Tanner from “Full House” to declare “How rude!” and kindly ask this gentleman (or is it a lady?) to put their bare feet under the seat. On the other hand, we are very impressed by the flexibility of this one, looks like we have a yoga enthusiast in here. 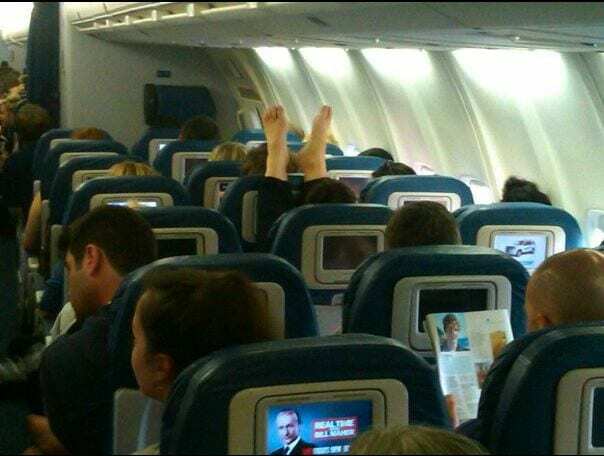 We’ve heard stories of people doing weird things with their feet on planes but couldn’t this person at least wear some socks? 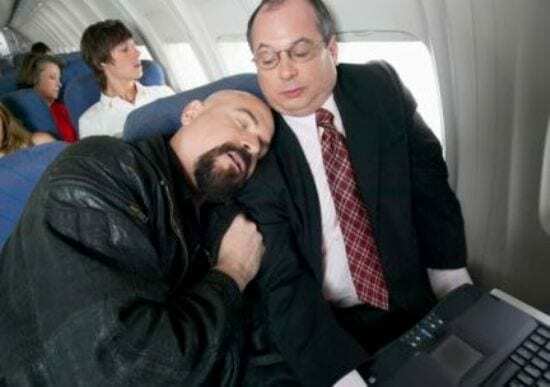 Ever wonder why people who sleep during flights always do it with their mouth open? Statistically speaking, this is 3 out of 3. Looks like we need to explore this quirky phenomenon a little further. 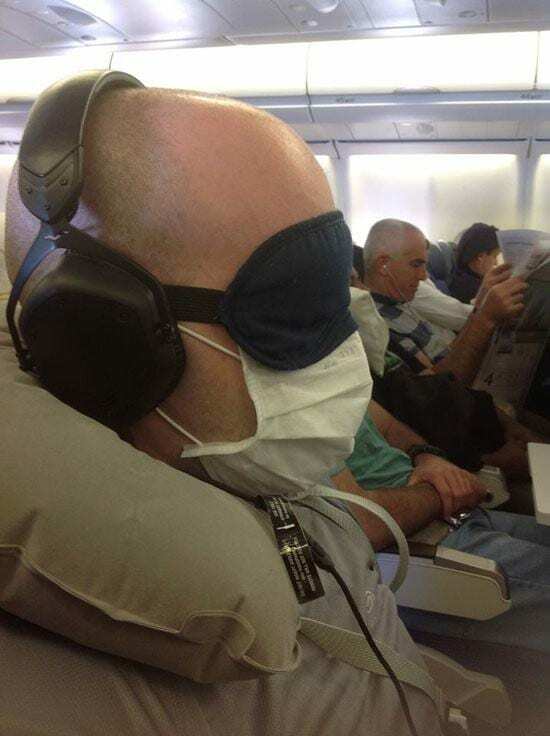 This is probably the reason why people get so sick on planes. With the combination of freezing cold air conditioning and a mouth like a venus fly trap, it’s always inevitable. 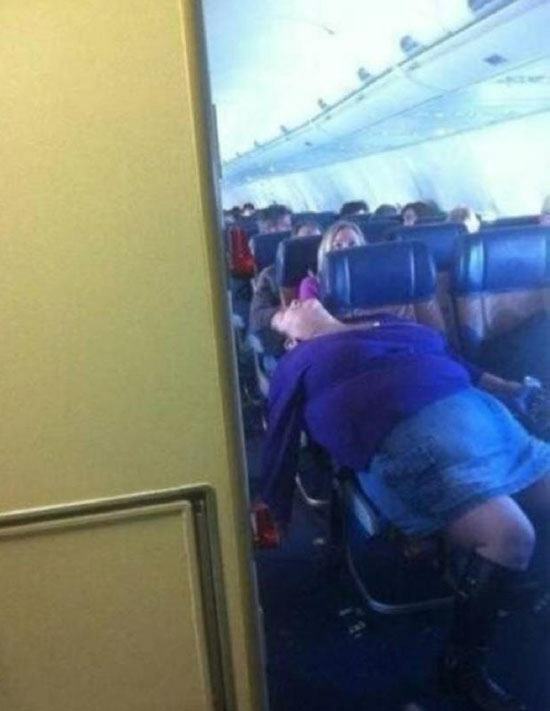 This is why all passengers should have vitamin c drops with them. It’s difficult enough enjoying a flight whether certain entertainment is available to you or not. In this specific case, these young children don’t even have the option of accessing their television. If we were them, we would take those dreads and braid them, then throw them over the person’s head. Or just be a real Debbie Downer and pull on the Rastafari’s hair until he wakes up. You know what we’re saying, mon? We’ve seen some pretty gross plane passengers on the internet but this one absolutely takes the cake. We aren’t sure who she’s meeting when she gets off the plane but wouldn’t it be more acceptable to use the bathroom when popping your pimples? The airport has, like, a million of them. Planes don’t come with skin specialists and facial options for a reason. This, right here, is most definitely one of them. Someone tell her to stop! Leave it to a sassy little girl to act out what everyone else is thinking. Quite frankly, this passenger should be told that what he’s doing is rude and totally disgusting. We have a strong feeling though that this little girl made it known as point or another after this funny photo was taken. On the plus side, you can always count on kids to speak the truth even if it is a bit harsh. 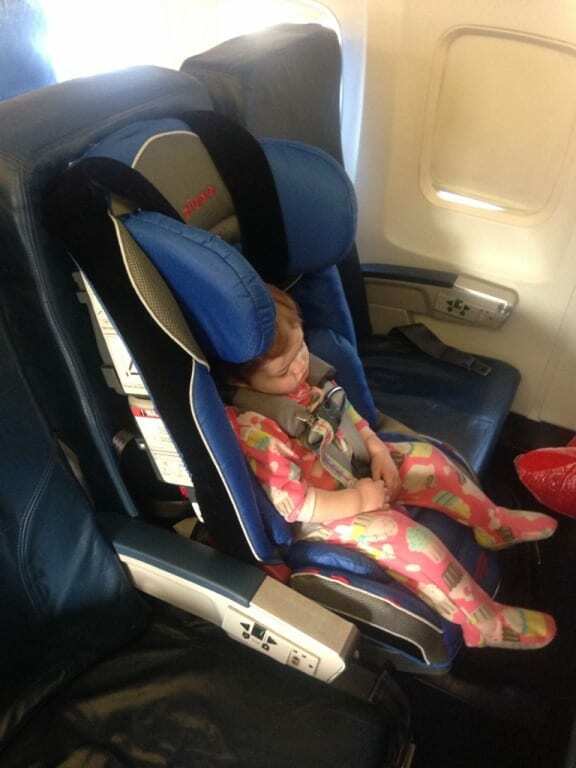 This mama got so crafty that she used her baby’s stroller cover to shield her from her seat members on the plane. 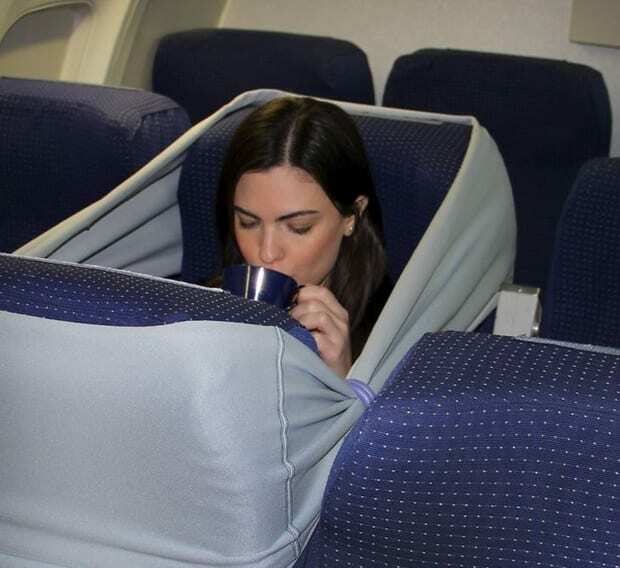 This is actually a brilliant idea compared to the sheets, towels, t-shirts, and other strange objects we’ve seen people use to cover themselves on plane rides. The question still remains, though; if this baby mama has her kid’s stroller cover, then where is the baby and what is he or she riding in! Maybe we never got the memo, but we had no idea plane walls were available to artists and children’s use! But seriously, the fight attendants who were left to clean up this kiddie mess probably weren’t too happy about this explosion left behind. It looks the inside of a pre-school classroom exploded and none of the parents taught their kids how to clean up after themselves. Can’t they just watch an episode of Barney to learn that? 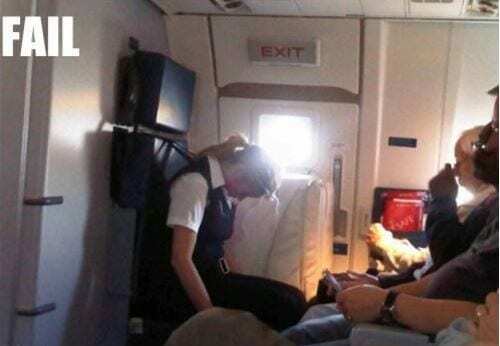 We aren’t sure which part of this plane picture is the funniest; is it the female passenger doing yoga or is the many facial expressions directed at her from the other passengers on the flight? That guy in the back sure seems to be getting a nice view, though. If she wanted to make some quick cash, she could charge everyone for a class. 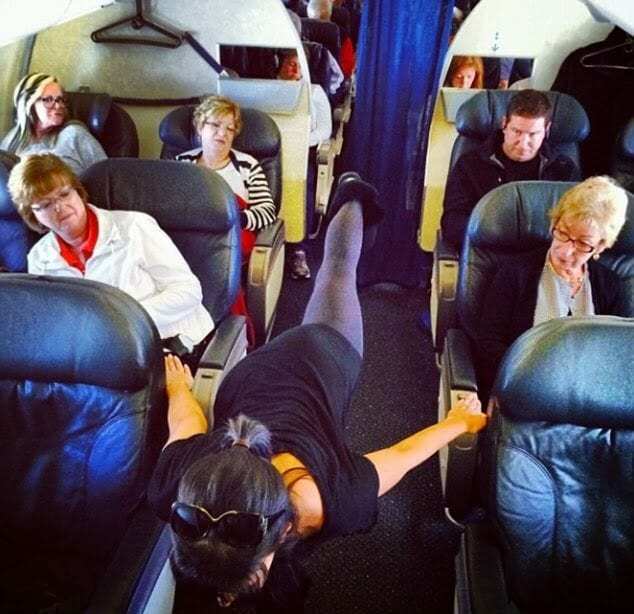 If she wanted to turn it into a hot yoga class, she could have the attendants turn off the air conditioning. There’s an obvious, cliche pattern that continues throughout our list. We’ll never quite understand why passengers assume that it is appropriate to sprawl out on the seats and sleep. If they concealed their intimate napping positions maybe it wouldn’t be so bad. Would it? Actually, if these people managed to bring their own blankets along and cover up while they laid in the exposed positions then that would make it a bit better. Only a bit, though. 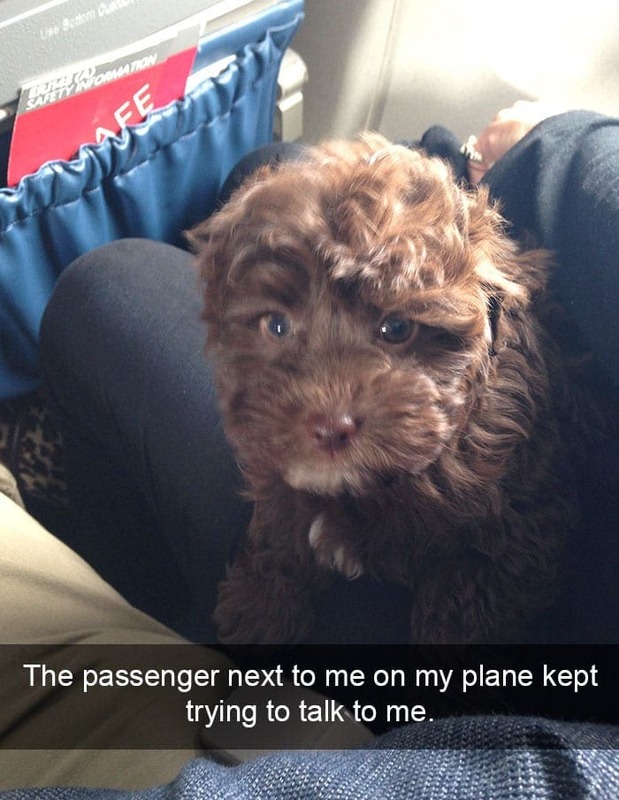 Out of all the annoying passengers on the plane, this one has to be the most adorable. We actually wouldn’t mind one bit if this little guy interrupted our beauty sleep for a friendly chat. No one can resist that sweet little face. The only problem is where is he going to go to the bathroom? If it’s a long flight, we’d begin to wonder how long that little bladder of his can actually last. The look on this dude’s face says it all. When you board a plane and set yourself up to feel comfortable, we don’t think that includes getting undressed as you would before jumping into bed at home. 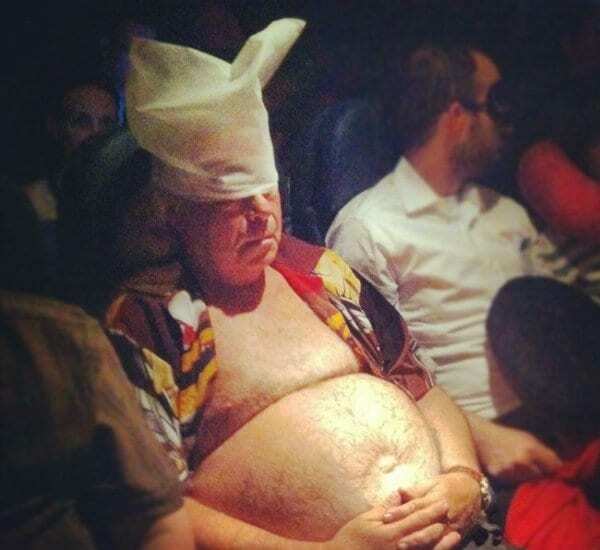 There wasn’t one brave flight attendant who would throw a blanket on top of this guy? For this poor passenger’s patience, he should get half his money back on the flight. Or, at least, a complimentary beverage that will make the time fly. We know turbulence can be dangerous at times but isn’t that what seatbelts are for? 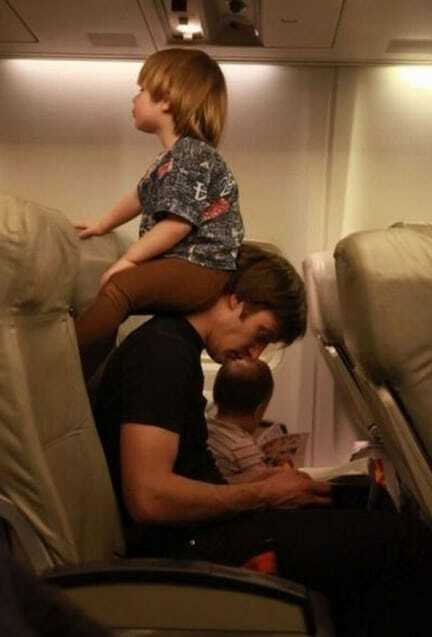 On the other hand, it could be a restraint tactic that these parents are using to keep their kid calm on the plane? If so, we probably wouldn’t blame them for it. We shouldn’t underestimate the child’s attachment to her booster seat. That thing gives her the ‘boost’ she needs in life! Yes, we threw that pun in there on purpose. Do you remember that annoying game your siblings used to taunt you with when you were younger? They would place a finger or hand (sometimes even a foot!) as close to you as possible without actually touching you. This poor passenger is being subjected to that, right here. If he’s never experienced this game before, he’s either never had any siblings or just got really lucky growing up. It’s super annoying and we don’t miss it. Apparently the rules of a restaurant – no shoes, no shirt, no service – don’t apply to passengers on airplanes. This man reminds us of Chef Boyardee if Chef Boyardee was pictured on his ravioli labels with an unbuttoned t-shirt. Sitting next to this man on the plane would probably be pretty uncomfortable. At least none of the passengers look too disturbed. They might have been hoping he had some canned ravioli for them, though. 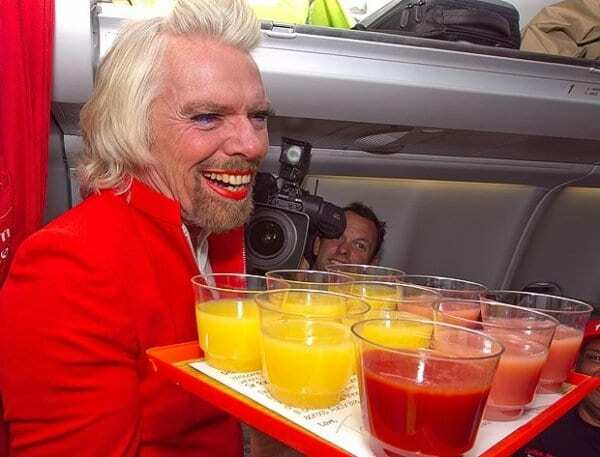 Pictured below is Richard Branson, the owner of Virgin Airlines, who lost a bet to the CEO of AirAisa, Tony Fernandes. Because he lost a friendly bet he needed to dress and work as a female flight attendant on a 6-hour AirAsia flight. It’s funny to see Branson playing the part he and other CEOs employ people for, but it’s even funnier to know that even the most serious of businessmen can get “dragged” into something like this!